over 400 session-hours to learn from our instructors—over 140 of the best in the world! Details about Overland Expo EAST near Asheville, NC in October 2016, will be available in June 2015. You will receive a free printed copy of our Overland Newspaper at check-in when you arrive––it includes maps, schedules and all the info you need to plan for your weekend.
. . . is confirmed for 2016. Land Rover Experience is once again sponsoring the on-site overland driving course. The course will be staffed by a dozen of the top overland driving skills trainers in the world to provide custom-tailored skills instruction. Weekend Pass attendees and everyone can observe the motorcycle demos that are held in the arena.
. . . is returning for an even bigger 2016. Get ready to be blown away by our Camel Trophy Skills Area. Combining driving with hands-on instruction in a dynamic format will allow you to custom-tailor specific overland skills training: winching, rope-work and lashing, recovery, specialty substrates, spotting, bush skills, and more. We give the Camel Trophy Training Team a blank slate to design the ultimate overland skills training area. They won't disappoint! 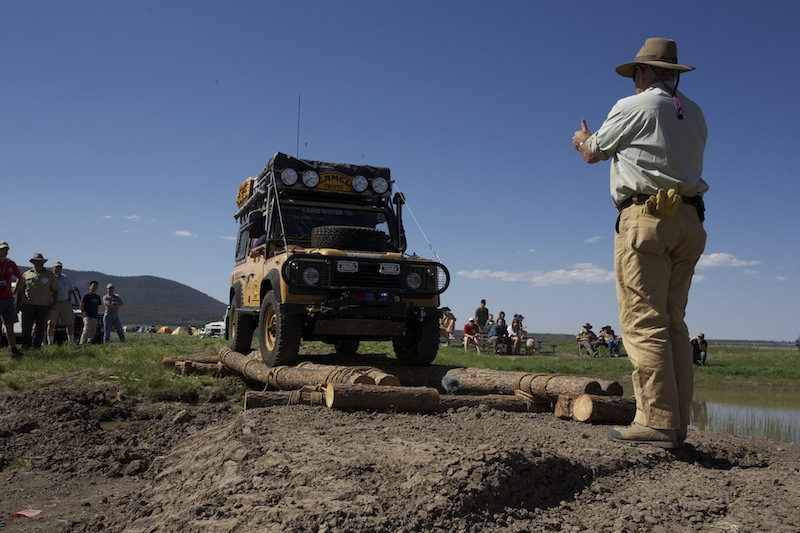 Overland Experience registrants can sign up for exclusive classes taught by the Camel Trophy Team. Weekend Pass attendees and everyone will have access to hands-on participation during Advanced Activities. Want to know how to get unstuck with only what you have on hand? The fundamentals of winching? These topics and more are covered in the Recovery and Skills Areas. Arm yourself with the best tool in the tool box . . . knowledge. Stop by the Overland Theatre to watch and listen to fellow overlanders share their experiences. Each year we offer a new selection of slideshows of trips from around the world. 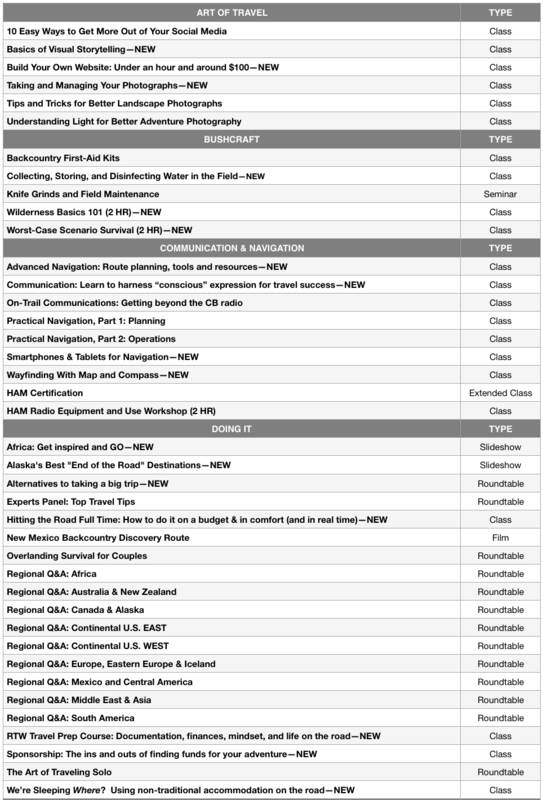 Check the schedule this year to see where you will be inspired to go next. Slideshows & Films and other evening programs are open to everyone. Overland Experience registrants will receive a detailed Program Guide after registration, which includes a program schedule with times and locations for your class selection. We do not publish the schedule online since it is reserved for registered students only. Most classes are offered more than once to accommodate the demand for popular classes. The following is for reference only. Offerings for 2016 WEST totaled a whopping 400 session-hours and 175 different classes and programs.